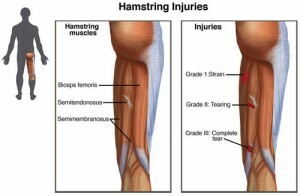 Hamstring Strain: what is it and how can we treat it at Mobilise Remedial Massage Brisbane? 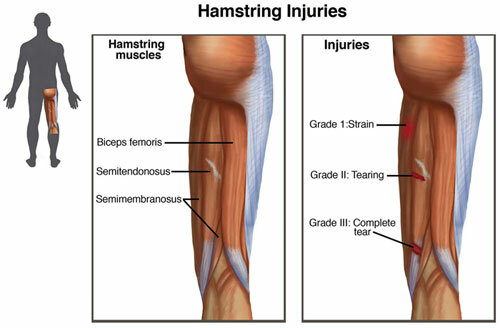 Hamstring (or ‘hammies’) strains are some of the most commonly seen sporting injuries. They can happen to any and every type of athlete from runners, soccer or basketball players to skateboarding or surfing. But what is a hamstring? Unbeknownst to most, the ‘hamstring’ is not a single muscle or ‘string’. It is a group of 3 muscles that allow the body to perform knee flexion and hip extension. They get the name ‘Hamstrings’ because butchers used to hang pig carcases by these strong tendons. More severe cases can be agonizing, making it impossible to walk or even stand. Typically a strain can occur from two primary reasons. Firstly poor eccentric (lengthening under contraction) strength will result in a tear in the muscle during deceleration of the lower limb during running. Secondly an over stretch of the muscle cause from shortening in the muscle itself, or excessive external force such as falling awkwardly with the leg out front. Poor running mechanics. This consists primarily of overstriding or poor pelvic control, which puts the hamstrings in a vulnerable position at ground contact. Improper warm-up. Your warm-up must be active and dynamic to prepare the hamstring muscles for the forces involved. Passive stretching is only one segment of warm-up. Inappropriate training loads. Your hamstrings are primarily fast twitch Type II fibres that fatigue quickly. High speed work should be done early in workout, as close to warm-up as possible to avoid fatigue. Fatigue (neural and local muscle). Lower back pathology. Abnormalities of the lumbar spine or poor pelvic control that can cause nerve dysfunction and subsequent muscle weakness can predispose you to injury. Poor playing surfaces. A wet slippery surface will put more strain on the hamstring due to slipping. How can I help my hamstring strain? Applying R.I.C.E (Rest, Ice, Compression, and Elevation) is essential. Cold therapy should be applied as soon as possible to help to quickly stop any internal bleeding. Ice can be applied for 10 to 15 minutes every hour initially reducing frequency as pain and swelling goes down. Seek the help of a Myotherapist. A Myo will help grade the severity of the strain as well as provide treatment and develop a rehabilitation plan. A thorough physical assessment will identify any underlying causative factors that may be problematic in recovery and prevention of further injury. A general body warm up, which includes sport-specific muscle stretching as well as sport specific skill drills. Have regular sports massage to aid muscle recovery post exercise, and to ensure good muscle health while you train. If you think you might have a hamstring strain, give us a call today to talk to a Myotherapist about what treatment plan would be best for you!